I have often said in this space that Donald Duck is at his best when he can have two things in a short. First, he has to be mean. Donald is an ill-tempered character and should always be portrayed as such. Not mean to the point of being unlikeable, but definitely mean. Second, he needs an adversary you can root for, not dislike. The opposition to Donald has to be a good character that is fun to watch, and gets mistreated by the duck. With Bee on the Beach, that formula works quite well. Donald has crossed paths with a bee many times in his shorts, and production notes and writings of the time usually give them different names. As such, many refer to the bees Donald faces as Spike, to use a generic term. It applies greatly in most cases, because the bees tend to use their stingers as a spike into Donald’s rump most of the time. This is no exception. It all starts, though, because Donald is being mean. When Spike tries to get his spot at the beach, Donald gets there and runs him over. 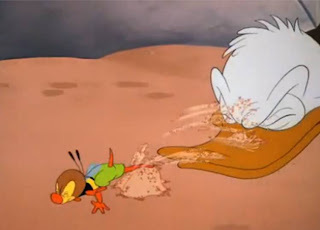 Then Donald drops water and sand on him, and ignores Spike when he tries to protest. He puts him in a bottle and tries to get rid of him. It’s these sorts of activities that give the viewer license to enjoy the tortures that Spike puts Donald through in the rest of the short. That’s why the formula works so well. Boy, does Spike torture him. After regaining his freedom from the bottle, Spike manages to track Donald down out in the ocean. For the next several minutes, he lets the air out of the raft Donald is floating on, first by taking the valve loose, then by puncturing it with his stinger. 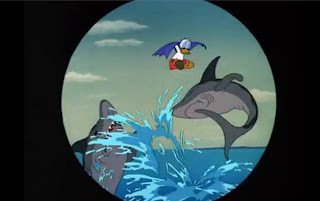 That leads to Donald zooming around the ocean and ending up right in the middle of a large grouping of sharks. Very unfortunate for a tasty duck, wouldn’t you say? What I love about this short is it’s willing to bend the rules to allow Spike to do some very funny things. 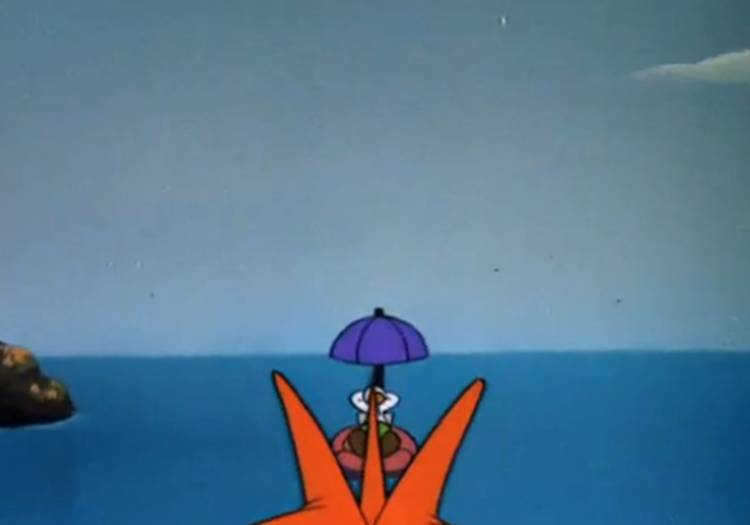 He goes underwater to cut the bottom out of Donald’s raft, and instead of drowning like most bees would, Spike manages to survive and thrive, coaxing a shark to attack Donald. 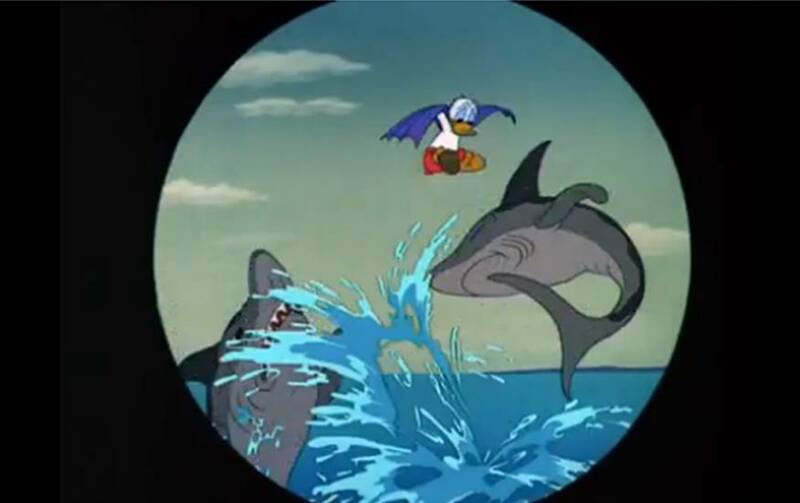 It’s things like this that make the gags interesting, the conflict more fun and ultimately lead to Donald jumping around the ocean trying to avoid sharks. That is a sight to behold. It's funny how I agree with you in that Donald's adversary needs to be a likeable character while Don himself is not, so the formula can work........And then you praise this short as an example of that formula working. This is without a doubt the most sadistic Donald Duck short of them all, and as a result the worst. (IMHO, of course). You mention the things Donald does to Spike at the beginning...Without acknowledging that Donald himself is NOT AWARE of what he's putting Spike thru. He doesn't even notice him until the bee addresses him, at which point it throws sand on his face. 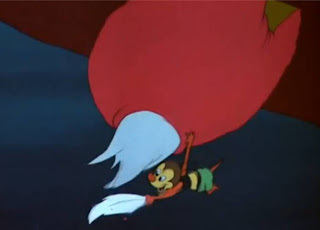 So in Donald's eyes, this bee just started screwing with him for no reason, and thus, he's only doing a fair retaliation by containing it in the bottle. This makes the already sadistic punishment that follows already more cruel than it is. The bee shows no remorse. The short ends with the bee watching as Donald's surrounded by several hungry sharks actively wanting to eat him alive, as he's struggling to survive, and LAUGHS. How in Sam Hill I am supposed to root for this obnoxious, sadistic insect who revels on such fatal pain, let alone when Donald's not in the wrong to begin with? I disagree about being sadistic as I find this to a good cartoon although it's not my favorite bee short (that would be "Slide, Donald, Slide"). And might I remind people that this is Donald we are talking about, not Daffy. What do ya mean by bringing up Daffy, nickramer? I was reffering to the later "Daffy vs. Speedy" shorts. I'm afraid I don't get what's the point of bringing that here...Is it that Donald vs Small Pest works while Daffy wouldn't? Sure, if you wanna go for that...But we ain't discussing Daffy here. I reiterate my intense dislike for what I perceive as the most sadistic Donald of them all. And I reiterate my statement that it isn't. An opinion I do respect, esteemed nickramer, but I'd appreciate you elaborating on it for the sake of discussion. Well, Donald is the person that gets into bad luck no matter if he caused it or not and hot temper. This situation doesn't work with Daffy as he's supposed be Looney and/or egotistical, not a bitter foe. Does that makes some sense? Otherwise, it's hard for me to explain why it works with one duck and not the other.